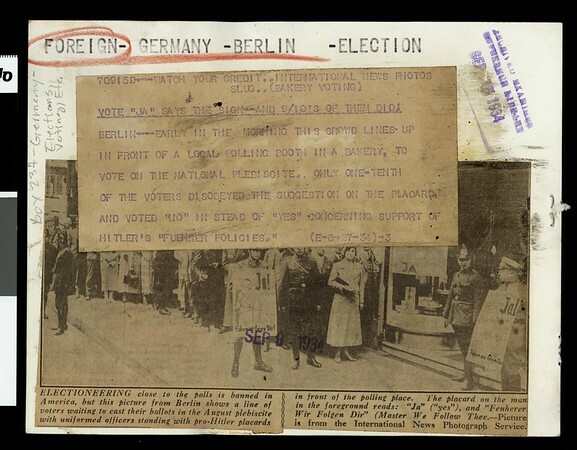 "Electioneering close to the polls is banned in America, but this picture from Berlin shows a line of voters waiting to cast their ballots in the August plebiscite with uniformed officers standing with pro-Hitler placards in front of the polling place. The placard on the man in the foreground reads: "Ja" ("yes"), and "Feuherer [sic] Wir Folgen Dir" (Master We Follow Thee). -- Picture is from the International News Photograph Service" -- Examiner clipping attached to verso, dated, "Sep 9, 1934".